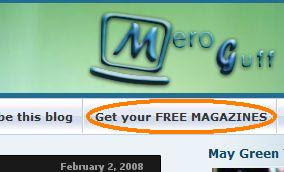 If you haven't noticed yet, there is 'Get your Free Magazines' link at the top navigational bar of this very blog(which I created yesterday). Yeap, that's right, I've partnered with tradepub.com and all the magazines that you subscribe will be free. If you read magazines or whitepapers of any topics, then you click that link above and subscribe to their magazines. It'll reach to you. But, before magazines get delivered to you, you've to answer couple of questions. These questions are asked to confirm that you are the appropriate would-be readers of the magazines you are subscribing to. You don't want to subscribe to the magazines related to Agriculture when you know your niche is in Sales and marketing. So, just to check out these issues, you've to answer few of the questions and once you submit the request, they'll verify it and if nothing went wrong, you'll be approved and you'll get your magazines at your doorstep. Since, I'm a tech lover,the first page that above link takes you to is the page with Tech-related magazines. I'm assuming most of my readers are interested in computer and technology. If that's not the case, there is another way to get your choice of magazines. It's simple to select categories other than Tech at the left hand side and to subscribe. Do you think I'm marketing some stuffs?? nope.. You may be wondering what will I get?? nothing except the publicity and the small fees that a normal paperboy would get to deliver newspaper home to home. You don't have to pay any money still but I'll be doing a job of paperboy i.e. delivering you the newspaper. Hope that clears some confusion. And, I think they'll be making money off the advertisers published on magazines. This is not a marketing that I'm doing. I'm just channelizing the source of informations to you. Sure, why not.. health care section is there and other interesting categories are there to follow up..